Floris de Witte’s spirited defence of free movement focuses on EU integration through law. But there is something important missing in his story. The battle for freedom of movement and European integration is no longer fought primarily in the courts where individual rights trump majority preferences; it is increasingly fought in polling statioins, parliaments and the mass media. In order to survive, European integration through law will have to be complemented with integration through democracy, by winning the hearts and minds not only of mobile Europeans, but of immobile ones as well. The Brexit vote on 23 June 2016 has cast a long and dark shadow over our debate on free movement and the future of EU citizenship. At several points in the past, the European project has experienced periods of crisis or stagnation. But now is the first time that it seems to be going into reverse gear with two possible outcomes: the EU losing one of its largest member states or a process of disintegration that could affect the Union as a whole. The Brexit referendum was not inevitable. It was a political gamble by David Cameron to overcome a split in the Tory Party. After the vote the attitude of political irresponsibility that caused this mess in the first place has been spreading like a contagious disease across the political spectrum, with the most prominent Leave campaigners refusing to take responsibility for the disastrous consequences of their victory and the lukewarm Remainers like Jeremy Corbyn incapable of realizing the historic dimensions of their failure. Brexit was not thus British destiny but a contingent outcome triggered by an extraordinary lack of responsible political leadership. Yet this does not mean that there is no need for grasping the deeper forces that made this result possible and that are in no way uniquely British. Floris de Witte’s spirited defence of free movement focuses on its contribution to individual liberty, to cosmopolitan conceptions of justice and democracy and to overcoming exclusionary national communities of fate. I broadly agree. But there is something important missing in his story. What he does not speak about is the reactionary backlash against intra-EU mobility that threatens now to determine the outcome of votes not only in Britain and could sweep right wing populist parties into power in several continental member states. While the Remain campaign focused on the economic folly of Brexit, the Leavers won the battle by mobilising popular resistance against free movement rights of EU citizens. Many post-referendum analyses agree that there is a new political cleavage in Europe that can no longer be reduced to the traditional divide between left and right and that is most strongly articulated through citizens’ attitudes towards European integration. The social characteristics of populations on either side of this divide are everywhere the same: young versus old, high versus low education, urban versus rural, and – less universally so – female versus male.1 Yet there is one further characteristic that tends to be overlooked and that is causally connected with political stances on free movement. Mobile citizens tend to vote for pro-European parties or policies and immobile ones for anti-European ones. One of the most striking charts published by the Financial Times after the Brexit vote shows a very strong positive correlation between the percentage of local residents who did not hold a passport in 2014 – and thus were unlikely to have travelled abroad – and the share of the Brexit vote.2 It seems we are witnessing a political revolt of immobile against mobile Europeans. Traditional cleavages along class, religious or ethno-linguistic fault-lines divided the political spaces of nation-states into distinct segments who lived either in separate parts of the state territory or in separate life-worlds. These divides could be either bridged through consociational power-sharing between parties representing the different sections or eroded through fostering geographic and social mobility across the divides. The new European cleavage is different because of divergent political spaces and time horizons. Mobile citizens regard Europe as their emerging space of opportunity and increasingly also of identity, whereas the immobile ones look back to the time when closed nation-states provided comprehensive social protection. Floris de Witte shares the diagnosis: ‘The main fault line that seems to be emerging is that between mobile and immobile citizens in the EU’. But he is not interested in bridging the cleavage. 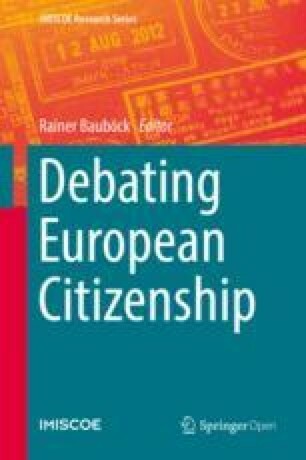 Instead he criticises ‘those scholars and politicians who wish to understand EU citizenship to be primarily about the connection between all Member State nationals and the EU rather than focusing on the rights of mobile citizens alone’. This is the wrong response to the crisis. As long as European citizenship is nearly exclusively about free movement, immobile Europeans will not perceive it as a value and as an important aspect of their identity. I agree with Daniel Thym that what is needed to win this battle is ‘a vision of social justice for the Union as a whole, not only for those moving to other Member States’. For de Witte, ‘[t]he scholarship on “integration through law” suggests that law is both the agent and object of integration, and is used to push through the objectives of integration even in the presence of political objection on the national or supranational level’. But today, this seems like the strategy of generals who always fight the last war. The battle for freedom of movement and European integration is no longer fought primarily in courts where individual rights can trump majority preferences; it is increasingly fought in polling stations, parliaments and the mass media. In order to survive, European integration through law will have to be complemented with integration through democracy, by winning the hearts and minds not only of mobile Europeans, but of immobile ones as well. The gender gap was especially dramatic in the recent Austrian presidential elections: On 22 May, 60 per cent of female voters cast their ballot for the left-liberal green candidate, while 60 per cent of males voted for the right wing populist one. John Burn-Murdoch in FT, 24 June 2016 (based on data from 382 voting areas), available at https://www.ft.com/content/1ce1a720-ce94-3c32-a689-8d2356388a1f. Recchi, E. & J. Salámonska (2014), ‘Europe between mobility and sedentarism: Patterns of micro-transnationalism and their consequences for European integration’. Unpublished working paper. Kuhn, T. (2015), Experiencing European Integration: Transnational Lives and European Identity. Oxford: Oxford University Press.